Utagawa Hiroshige (1797-1858) A Comparison of the Ogura One Hundred Poets # 63: Sakuramaru and Yae, 1847. Oban. A remarkably well preserved print from the finest collection of ukiyo-e of the nineteenth century. 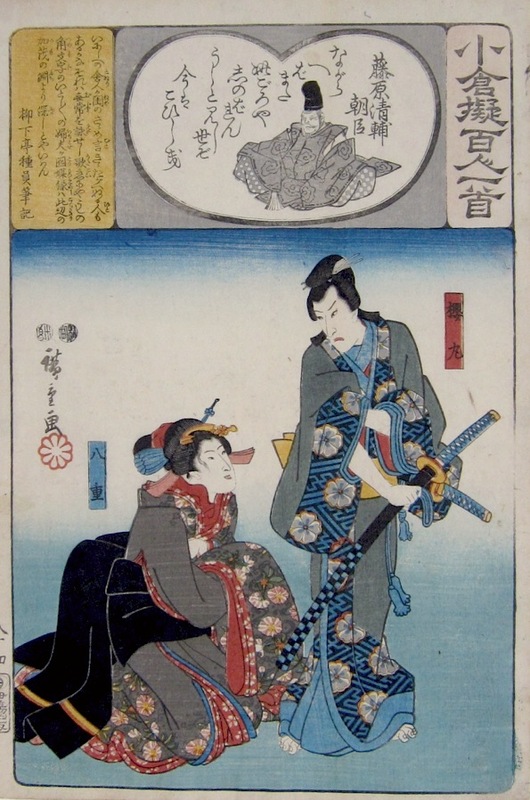 In 1845 the publisher Ibaya Senzaburo commissioned the three leading artists of the day, Hiroshige, Kunisada and Kuniyoshi, to contribute to an anthology of one hundred poems by one hundred poets. The poem is written at the top of the print and a scene from history or drama is illustrated below, each scene being an obscure allusion to the subject of the poem. It is a curious fact of art that a superbly drawn and highly considered piece of art such as this by Hiroshige should have so much less value - monetary and critical - than so many of his often hasty and repetitive landscapes. Hiroshige is underrated as a figure draughtsman, and a piece such as this; sensitively drawn and rich in allusion deserves far more attention than it is usually given. At the time when the authors were working on the play, a great stir was caused in Osaka by the birth of triplets. It was therefore decided to make use of triplets in the new production and thus it was that Matsuomaru, Umeomaru and Sakuramaru came into being. For the purpose of the story, the triplets are the sons of Sugawara's retainer, Shiratayu. When they were born, Sugawara stood sponsor to all three and named them after the trees he loved best, Matsu (Pine), Ume (Plum) and Sakura (Cherry). (The Kabuki Handbook). If I live longer, shall I again, I wonder, yearn for these days too? The world that I once saw as bitter is dear to me! She comments that despite the pain of their brief liaison, life was still sweeter than life without her beloved. Full size with margins (a slight trim to the left edge). Colour and impression are fine and condition excellent. The print is illustrated in Herwig & Mostow, The One Hundred Poets Compared, Hotei Publishing 2007. Signed Hiroshige ga. Published by Isabay Sensaburo.